This is our formal request, to the City of Calgary and applicable City departments, to allow Street Church Ministries to host a Christmas celebration at Calgary’s municipal plaza on December 20th or on December 27th, 2009. In the past (summer 2009), we have had discussions, regarding holding a classical music festival at the municipal plaza, with Steve Patterson, Security Advisor for Corporate Security. During those discussions, he indicated that he was in favour of working together to put such a festival on. In fact he loved the idea. 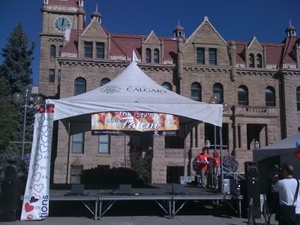 He later expressed that, although he was very much in favour of this idea, David Louis and other City lawyers asserted that the City of Calgary cannot allow such festivals to go on at the municipal plaza, especially if such an event would be amplified. He, himself, indicated that he is afraid of making the decision on his own, without the support of the mayor, for fear of losing his job. In view of recent events, with the United Way holding its second annual “The City’s Got Talent” event (Corporate Events Calendar) in the municipal plaza, with amplified sound, it is now clear that either the City lawyers were mistaken or the City is showing favouritism, discriminating against our organization with regard to the use of the public plaza. It is quite clear, since the city erected its own tents and equipment in support of the United Way, that the City is open to amplified events of third party humanitarian organizations in the plaza. I am sure that the City will reconsider its position on this matter since, it is clear that not reconsidering would represent an egregious violation of our rights to access to public facilities and venues, on an equal basis to other organizations and groups. It has come to our attention, with the release of the City of Calgary’s 2009 “Pride Month” proclamation release, that our Mayor and city council are moving in a direction of tolerance for all. I find that very ironic after four years of trying to receive tolerance for the efforts of our ministry in dealing with the City’s homelessness crisis, but instead of receiving tolerance receiving harassment and intimidation. Having said that, this new proclamation is shocking to us and demonstrates a new direction for the City. In particular, we note that the city is embracing new values towards “all citizens”. For example, we noticed that the City has now recognized that Calgary benefits “from the talent and involvement of Calgarians from our many communities”, that “All Calgarians expect and deserve the opportunity to live, work and participate fully in our community”, that the City “recognizes and supports the significant cultural and economic benefits a diverse population brings to our city”, and that the City is now interested in “respect of global human rights, ideals” and wants to operate “in the spirit of encouraging greater acceptance and understanding in our city”. Obviously, Calgary’s lawyers will understand that such statements, issued by the mayor himself, reflect an attitude of City Council, of being inclusive and open to diverse views and beliefs and demonstrate a desire on behalf of the City, to allow for public expression of those deeply held views with the endorsement of City Council. With this in mind, we request that the City grant us access to the municipal plaza, as stated above, for our Christmas festival, that City Council allow us to raise a flag for Jesus, the central pillar of our faith, on one of the masts in front of City Hall, just as it allowed the homosexual community to raise its flag on a mast during their “pride” event (Sun News Coverage), and we humbly asked that the Mayor would demonstrate his desire to show “greater acceptance and understanding in our city”, by releasing a proclamation that the month of December would be called “Jesus Month”. We are, as always, open to suggestions on how we can work together for the better good of our city and for the provision for the needs of Calgary’s most vulnerable citizens, who also “expect and deserve the opportunity to live, work and participate fully in our community”, as indicated in the Mayor’s proclamation. Even though we have checked the City’s schedule to ensure the availability of the plaza for our event, on the days we have proposed, which shows that the plaza is available on those dates, never the less, we are willing to work with the City if there is a conflict we are unaware of. We will be waiting, with great anticipation, for your reply. We have copied this letter to the media, to Calgary’s City Council, to MLAs, to MPs, and to over 16,000 people on our supporters list. 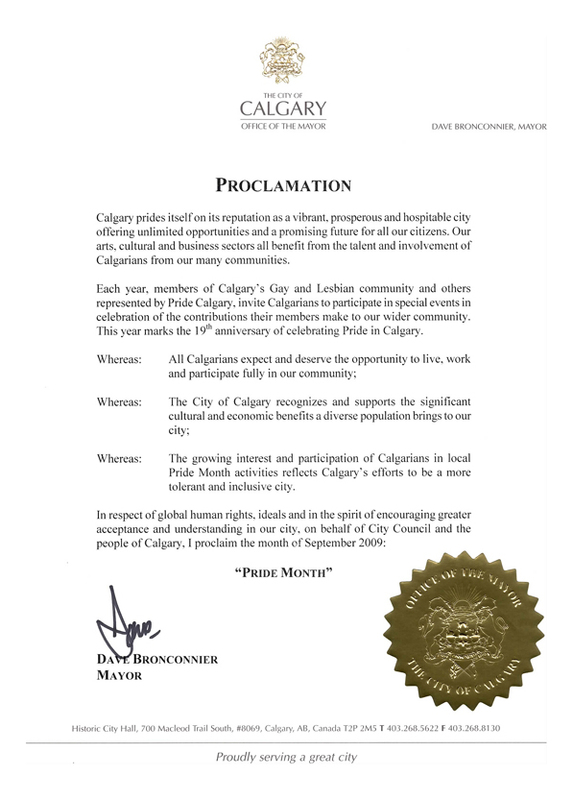 Below we have included a copy of the recently released “Pride Month” proclamation of the Mayor Dave Bronconnier, as referenced above.